TP-LINK Archer C7 AC1750 Gigabit Wireless Router is DUAL band wireless router that makes use of 802.11ac Wi-Fi standard, 3 times faster than wireless N speeds and delivering a combined wireless data transfer rate of up to 1.75Gbps. With 1.3Gbps wireless speeds over the crystal clear 5GHz band and 450Mbps over the 2.4GHz band, the Archer C7 is the superior choice for seamless HD streaming, online gaming and other bandwidth-intensive tasks. This Gigabit wireless router got 6 antennas in total (3 internal antennas). With 3 external 5dBi antennas serving the 5GHz band and 3 internal antennas serving the 2.4GHz band combined with higher quality antenna technology, you can maintain high speeds across greater distances. This provides you with incredible wireless coverage and reliability from anywhere in your large home or office. You can also configure Guest Network on this Gigabit wireless router to provide secure Wi-Fi access for guests sharing your home or office network. With one gigabit WAN port and four gigabit LAN ports, speeds can be up to 10× faster than standard Ethernet connections. The Archer C7 wireless router is a powerful hub to support a robust and extremely fast wired network. The router setup is pretty easy. Included in the resource CD, TP-LINK's optimized configuration utility can help users complete the entire software installation and wireless network settings in just a few minutes. Check out to learn more about this Gigabit wireless router here! Very happy with this purchase. It was very easy to set up and works great. Granted, I was switching from a router that I was renting from my internet provider, but this was like going from dial-up to broadband! Great router and good range but having UPNP will not work with PS3 so gaming will lag, especially UMVC3. I tried everything, even port mapping, port triggering, DMZ, etc., but the game still lags. Put in my old router and the game is smooth with no lag. Do not buy this one if you intend to play frame-counting games on PS3. Have not test with 360 yet but most likely the same thing. 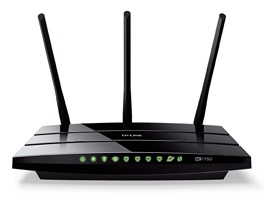 The TP-Link AC1750 or Archer C7 is one of, if not the best, routers that I've owned up to date. Previously, I owned a Netgear N900 WNDR4500 and it gave me nothing but trouble. I constantly got bad connections/dropped connections. In the middle of a video phone call, browsing the internet, streaming videos through Roku etc., I would get dropped signals without warning. After purchasing the TP-Link Archer C7 and owning it for a few weeks now, I can confidently say that this router is really up to par. We're a family of many wireless devices including 4 laptops, 1 Ipad, 5 gaming consoles, 4 phones connected through the WiFi, 1 Roku 3, etc. Naturally, we needed something that can handle all of these wireless devices. We have devices that are 5GHz compatible and we have had no issues running the devices through the connection. The 2.4 GHz connection was also great with a stable connection. Don't be deceived by the negative reviews here on Amazon. TP-Link has come up with a new firmware and there are no bugs whatsoever in the router. Overall, I would definitely recommend this to a friend and look forward to purchasing TP-Link products in the future. I like it, but wish the instructions for all of the functions that the router is capable of, where a little bit better stated or explained. I bought this router for all of the functions listed and future proofing listed. It is just a little difficult too tell if some things are set correctly. I am not able to connect a blueray player to the network for some reason or another, have not figured that out yet, it may be the blueray player? Great concept, inconsistentVery disappointed with the router. When it works it is extremely fast and has a great range, but I have to reboot it multiple times a day or switch between 2.4GHz and 5.0GHz to make it work. Have tried everything and cannot make it work consistently for a complete day. Aside from that, setting are very easy to use and very easy to configure. LAN works fine. Return to top of "TP-LINK Archer C7 AC1750 Gigabit Wireless Router"! !